Our April map is jam packed with new exhibitions, artist talks, public art reveals and Capture Photography Fest events. These are just a few of the things on the immediate horizon that we don’t want to miss! LOOPDALOOP | This is a rotating, month-long exhibition at Burrard View Fieldhouse, where Iris Film Collective is in residency. 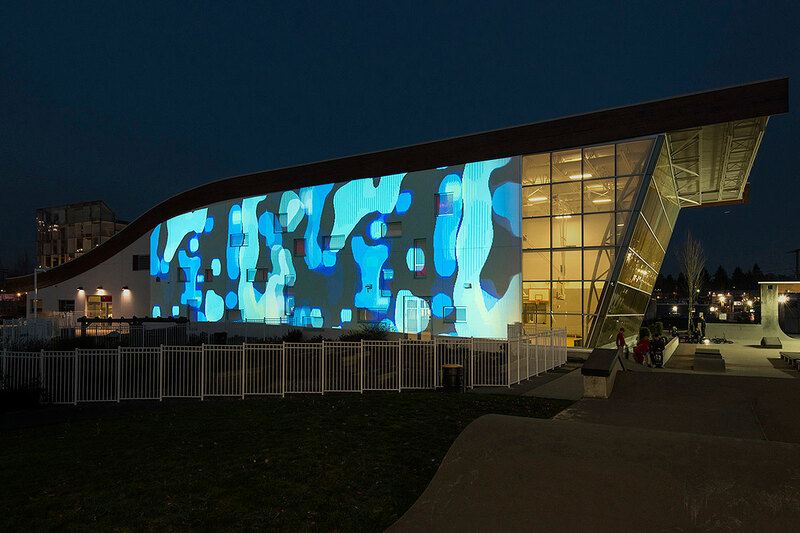 The project features a 16mm film loop installation created by 8 artists with a view to pushing the boundaries of 16mm film and projection by incorporating some element of interference in the production process. The 8 works will be on view for three nights each throughout the month of April. BAF | New exhibitions open at Burrard Arts Foundation on April 5th: Charlene Vickers’ Chrysalis, new works on canvas and paper; and Holly Schmidt’s Quiescence, sculptural works—papier maché plants—inspired by a 2014 residency in Santa Fe. And, in the BAF Garage, a space for artists to create site-specific works, Alex Achtem unveils Painting a Room Blue, where she covers the space with plastic cups, each filled with water each tinted a different shade of blue, in an attempt to paint the room. PARTICLES FOR THE BUILT WORLD | We’ve been anticipating this one! Particles for the Built World by Omer Arbel opens at Surrey Art Gallery. The exhibition focuses on Arbel’s experiments in concrete fabric forms over the past five years—from the research stage, to experimentation, and now to its application in the construction of a South Surrey home. The opening reception is on April 13th with an artist talk at 6:30PM. SUBARCTIC PHASE | Karen Zalamea’s latest body of photographs were produced using a handcrafted 4×5 camera and lenses made of ice—ice made of local Reykjavik water! THE POETS HAVE ALWAYS PRECEDED | This group show on at Griffin Art Projects in North Vancouver, explores the rich history of art and poetry in Vancouver from 1960-present. It includes notable emerging and established artists from BC and beyond, whose practice explores the visual and written. The awesome non-profit is looking for volunteers to help them reach and teach more kids in their Classroom Gardening & Cooking program.